The moment I clapped eyes on Californian designer Hayley Starr‘s magnificent frock creations, I wanted a pretty dress for myself – no make that three! Upon perusing her sensational website, I could immediately see the workmanship and love that goes into her designs. Made for every woman from size 0-16 (a real rarity), her dresses are for those with growing bellies, the young and grown-up, and for the tall and petite. Seems unlikely I hear you say but it’s quite amazing what Hayley has done with six simple and chic designs. Coined ‘Infinite’ and ‘Fancy Infinite,’ the dresses can be purchased in short, medium or long versions and from there worn in ‘infinite’ ways – up to 110! Take a look at the image below to see for yourself. 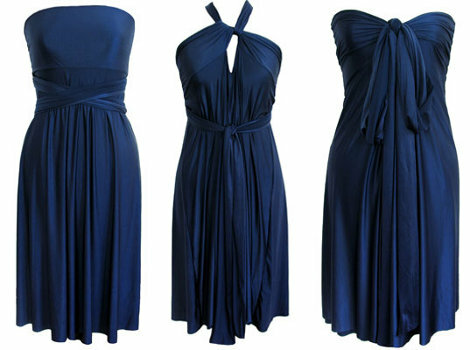 Those three dresses are actually the same dress worn in different ways. So you can buy one piece and end up with many more – perfection for our hot Australian summers when all we want is a nice breezy, flowing frock. All dresses are made by Hayley herself or a skilled worker in California and her absolute commitment to the environment and quality is second to none. To purchase one of her stunning threads, head to the Hayley Starr site. Prices range depending on design.